I feel like I’m overdue for a food update. Since the kids and I are home sick again, it seemed the perfect time to do one. I’ll be honest and tell you that one of my chief resentments this year has been the frequent need to table my farm/homemaking/etc. desires in favor of focusing on other things (hello, house building!). My particular role is the most flexible in this game, and I often have to exercise that flexibility. It is a worthy investment, but I have felt in limbo for a couple of years now. Of course, I know that the whole thing has been a good exercise in patience, in figuring out what really matters and prioritizing, of continually integrating the picture in my head of what I want my life to be with the reality of what it is and finding peace and sustenance there, and of staying grateful for how much we have and how much opportunity has been given to us. All good work, but I’m forever longing for a good garden out my back door. I want to hear chickens again. I want to stack all the canned goods together in my house without worrying about having to move them all in the middle of winter. I want to stretch out my roots. Soon. That said, making good food at home and filling the house with warmth is a thing that will forever feed my soul. I feel like I was built for that work, and it’s something I’m trying to lean into while I’m still exercising patience in other areas. 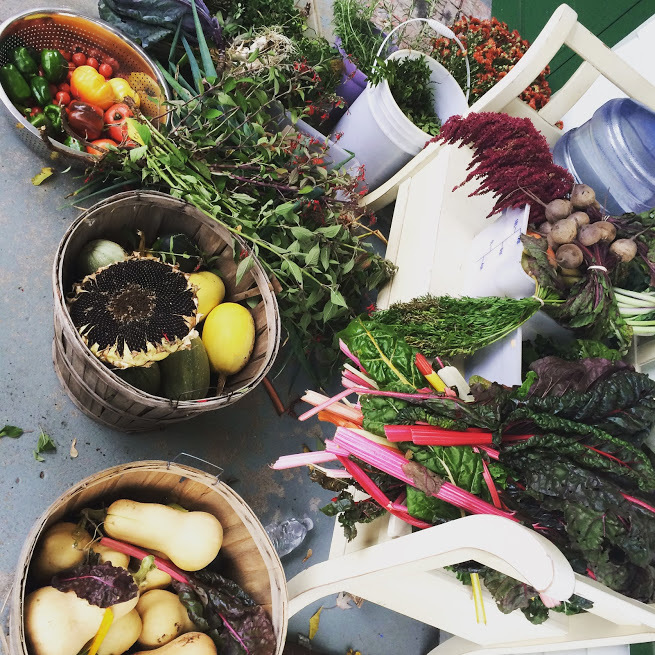 With the first frost hitting us last week, we harvested all of our tender crops and started to process them. It was very “throw and grow” again this year, but the whole time we knew we were going to yield more than we would having done nothing at all. The biggest challenge, I think, was keeping our expectations in check. Our official motto for the year was “Anything worth doing is worth doing poorly”, and I do believe we did right by it. And, at the end of the day, I can definitely feel the abundance. 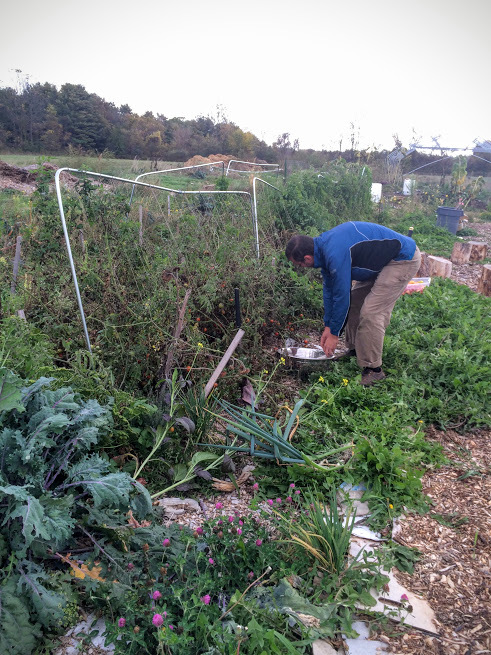 I’m grateful for the weedy garden that we could barely handle and all the food that came out of it. I’m grateful for the space to keep my microgreens growing so I didn’t have to pause my business while we make this big transition. I’m grateful for a good season at market. I’m grateful for an awesome partner in crime, Milton, who has become one of my dearest friends. He’s someone I can spend a 12 hour day with, end it all tired and covered in dirt, and we’ll still be happy and joking and talking farm/life philosophy. On top of that, we’re building good purposeful things that I hope will positively impact the community. I’ve been doing a little bit of food storage, and I thought I’d share a couple of my favorite things right now. 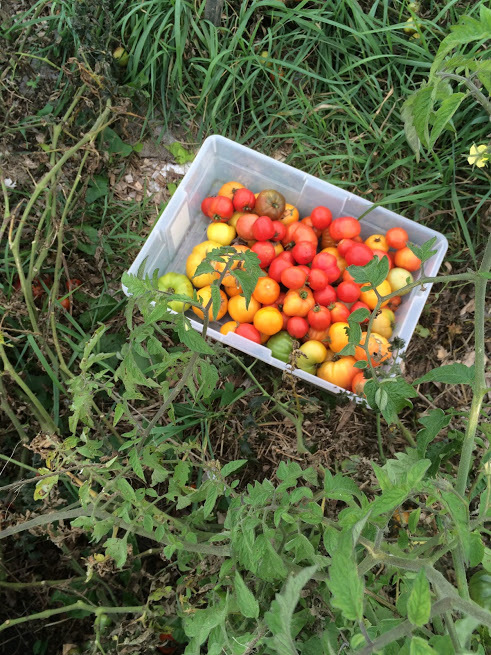 Tomato season has ended, and while it wasn’t as productive as years past, I still managed to put away 3 big batches for the winter. 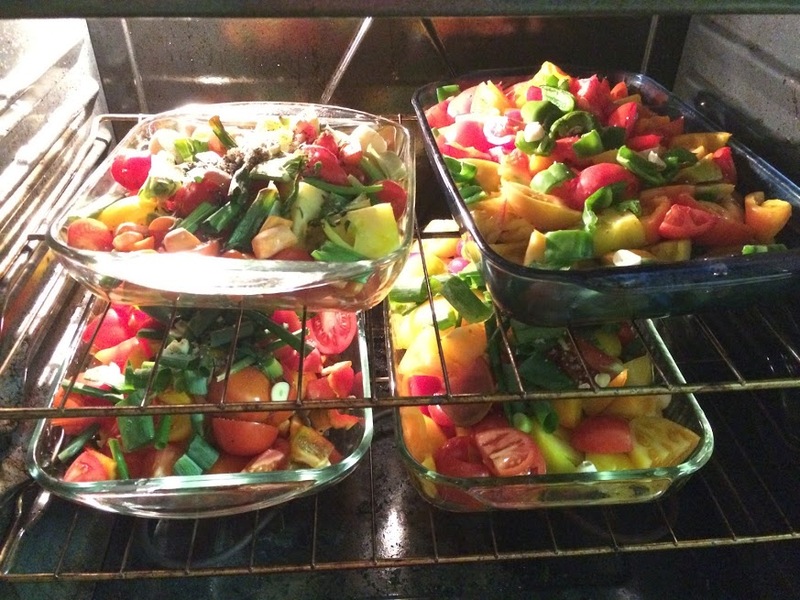 I have several quarts of stewed tomatoes, a big batch of tomato conserva, and a couple of gallons of roasted tomatoes with veggies, as pictured below. This is one of my favorite ways to preserve the tomato harvest. It’s very forgiving and quick. Basically I rough chop my tomatoes, throw in miscellaneous veggies on hand (in this case it was carrots, onions, peppers, and garlic). 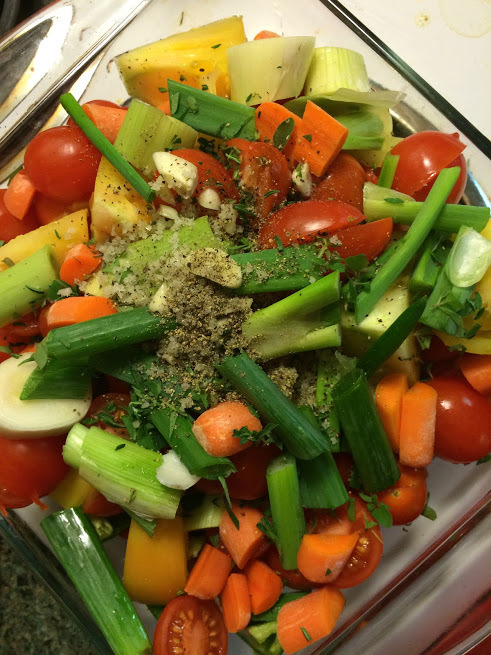 I add a good amount of salt and pepper, fresh herbs, and a drizzle of oil. Then I let it all roast together until it’s reduced and really aromatic. I put it into gallon sized bags and freeze flat, for easy thawing later. Easy! I’ll use it in a variety of ways- soups, on top of meat in the crock pot, on rice or pasta, etc. 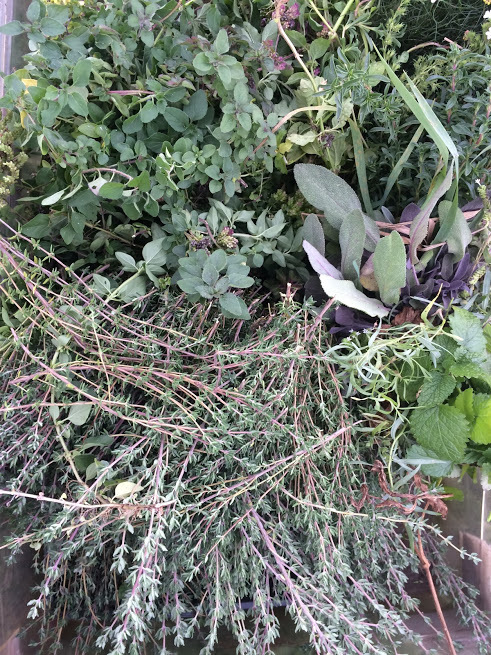 I don’t much like stored greens, as it turns out. I love greens in almost everything, but I really like them fresh. Thankfully, with season extension techniques, that is mostly possible. 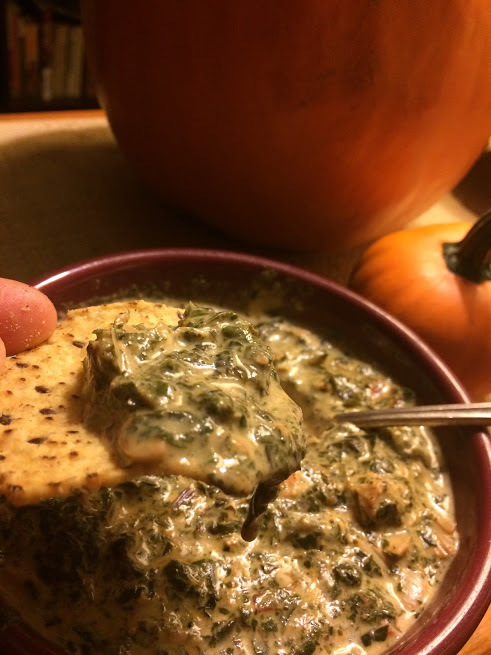 But, I did harvest this big batch of swiss chard, and so I chose to store it as a creamy dip. Also extremely easy and delicious. I cooked down a huge pot full of chopped chard in butter and a little splash of water. When it’s mostly reduced, I added cream cheese, a splash of milk, a healthy amount of garlic, salt and pepper, a squeeze of sriracha, and a good handful of parmesan cheese – all of it easily adjusted to suit your taste/preferred texture. To this one I also added a can of artichokes. Delicious! 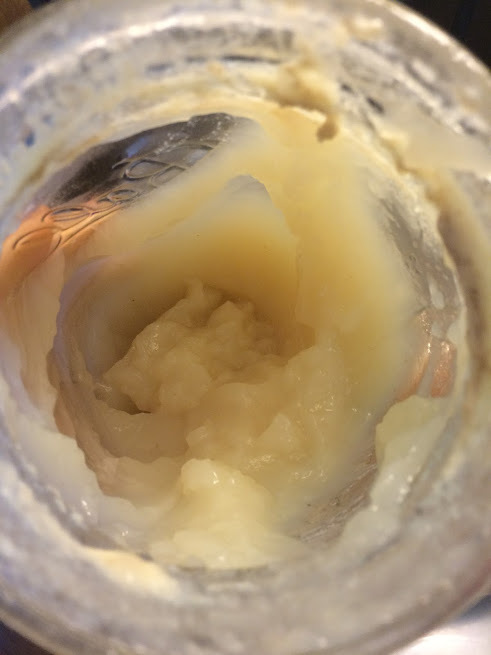 I froze it for an easy snack over the winter, and we like it so much I’m doing another big batch today. Lots of squash happening too. 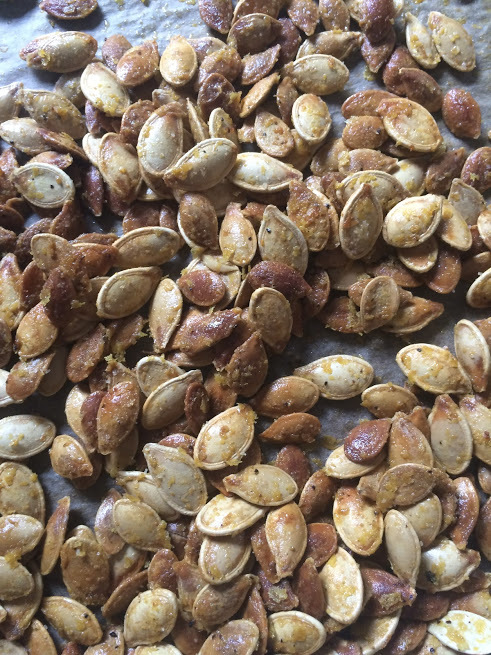 I am so happy to have found a trick to getting squash seeds to be less relentlessly chewy. All you do is boil them for 10 minutes in salted water, drain, then roast as you normally would. The result is a much crunchier, easier to eat snack. My favorite is drizzled in butter with salt, pepper, and nutritional yeast. Mmmm. I’m also really digging broth right now. I make stock all year round, since I hate to waste any part of an animal. Mostly that gets used to cook up rice or make a soup or sauce, but lately I’ve wanted to sip it out of a mug. It must be something about this season. Below is a picture of the beef stock I just made. It’s so full of gelatin I had to scoop it out with a spoon to use it. I’m in love with Pho. We have a great little restaurant nearby that makes a great bowl of the stuff, but I figured I should probably learn to make my own. It turns out to be really simple! I just simmered broth that I’d already made with ginger, garlic, onion, a splash of fish sauce, a cinnamon stick, and a few pods of star anise. 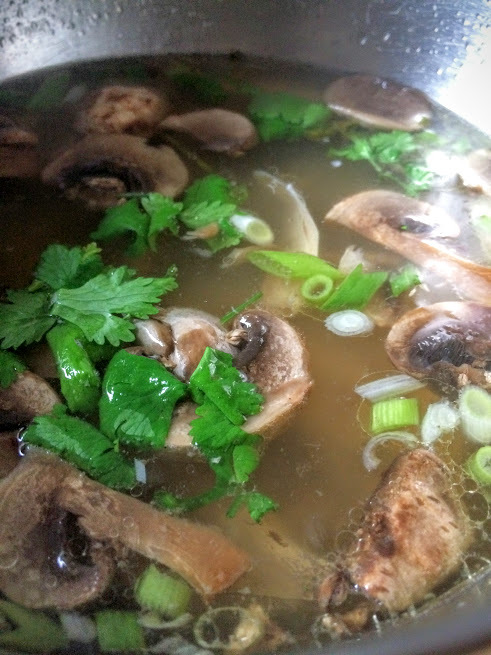 After about an hour I strained it, then added green onions, mushrooms, and cilantro. So good. This morning I had some with an egg whisked in and a little crumbled seaweed- perfect for my sick head. 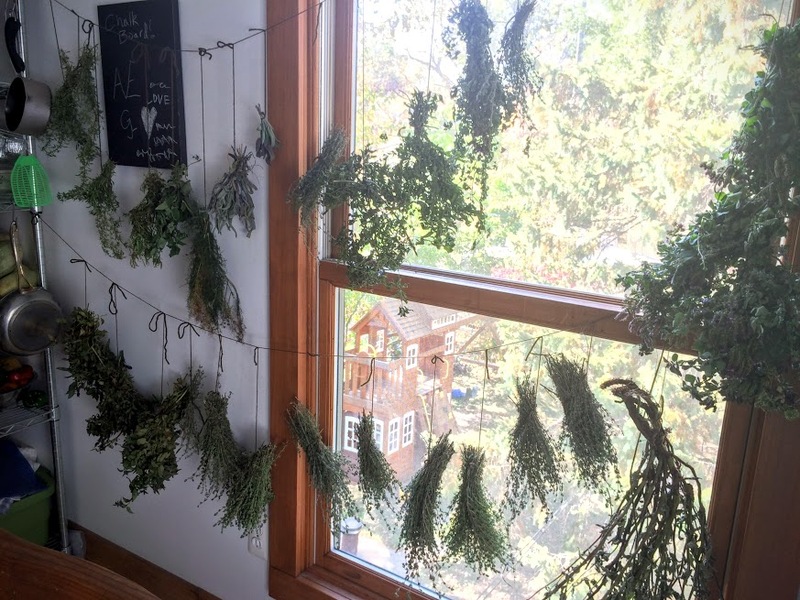 I also managed to bundle and hang a ton of herbs, although I’m not entirely sure what I’ll do with all of them. 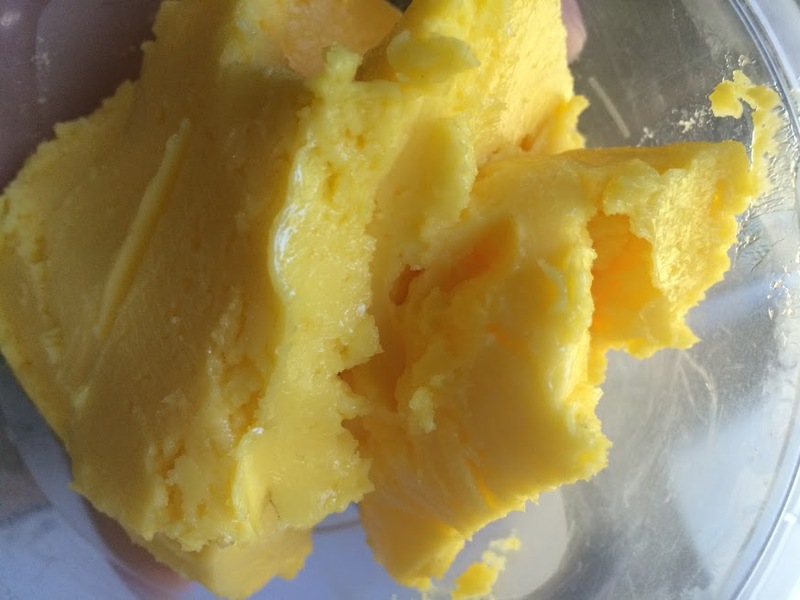 Another thing I’ve recently converted to- grass fed butter. I’ve long been a raw milk drinker, but I couldn’t bring myself to buy the butter. We live on a pretty tight budget as it is, and the grass-fed stuff is 3 times the price of other options. But, I went for it a few months ago and haven’t looked back. The quality is just so obviously higher. I get to support small farms and get better nutrition from this. It’s also so golden and beautiful and just… good. It’s also unsalted which I never put a lot of thought into, but you can really taste the complexity of the butter without it, including how fresh it tastes (plus you can always add salt). So we use it a little more sparingly and haven’t bought the pale regular stuff in a while. I’m happy with the decision. Anyway, that’s it on the food front, other than lots of crock pot meals to keep things simple. What are you eating these days?